Nowadays it has become very easy to collect data because many devices such as phones, cars and buildings have sensors like cameras, microphones, and GPS. All these produce raw data, which require pre-processing operations in order to be used. Signal processing was originally created to achieve this purpose. 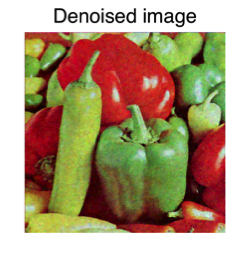 For instance, the output images of a digital camera sensor could be de-blurred, de-noised (see Figure 1) or compressed. This example shows some of the very particular tasks of signal processing. However, the range of applications of the field is much broader and concerns any kind of data: sound, video, social network profiles, environmental data, statistics, etc. Decision-making and prediction: In a world where we try to automatize every process, it has become essential to program computers in order for them to make the right decision. Is this patient suffering from cancer? What is the market value of this house? Which of these people are good friends with each other? Will this person like this movie? Who is this? What did you say? How do you fly this thing? With the correct dataset and the right algorithm, a computer is able to answer these questions. In fact, many algorithms are able to learn by experience, because, like the human brain, they look for similarities of labeled data in order to predict the label of new unknown data. This area is called machine learning. Information extraction: By becoming more available, the amount of data has exploded and has become a problem that signal-processing also needs to handle. Information extraction, also called big data, aims to search for the important part or the hidden structure of the data. Extracting financial trends, drawing the edges of an image, isolating an instruments in an audio signal are examples of such a task. Signal enhancement: Because sensors are imperfect and limited in accuracy, the measurements may not be as precise as desired. Information may also be corrupted during transmission, compression or storage. In order to remove these unwanted effects, traditional signal processing provides a wide range of tools allowing the user to super-resolve images, remove the clip of an old record, de-noise temperature measurements (Figures 2) or balance the colors of an image. Figure 1: When the sensor of a digital camera records an image, there is always some noise. This effect is particularly visible in low light scene. A part of this noise can be removed by signal processing techniques. Graph signal-processing: Graphs are used to exploit the intrinsic structure of the signal. Machine learning: This field is also referred as artificial intelligence. Optimization: It is a central mathematical tool used in Machine learning and signal processing.